Now that I’m nearing the end of summer vacation, it’s time to go into productivity mode. 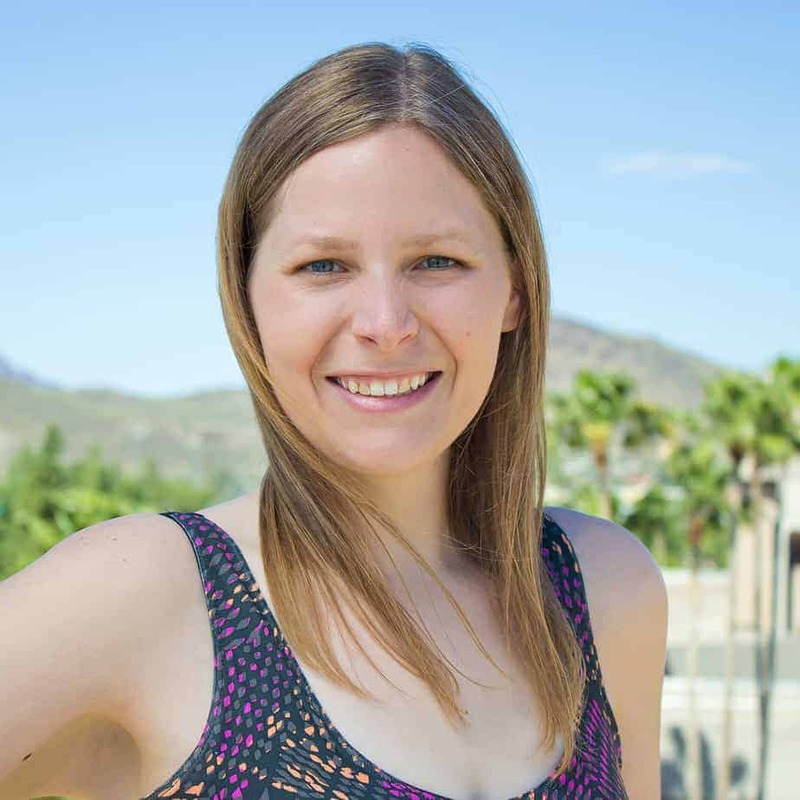 This is the time of year that I try to do everything I can to prepare for the school year. I have a new planner (with color-coded pens to match my color-coded scheduling system), meal plans written up, and, the biggest deal of all, a stocked freezer. The freezer in my new place is much smaller than I’m used to, so I haven’t been able to stock it as much as I have some other years, but it’s currently full of chicken breasts, cooked ground beef and onions, No Bake Energy Bites (from Gimme Some Oven), homemade meatballs, a Loaded Baked Potato Casserole, and lots of breakfast burritos. 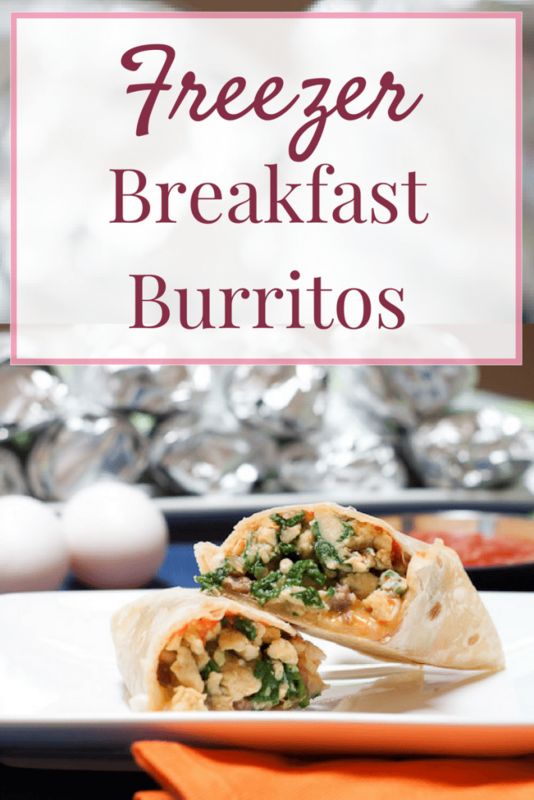 Last year was the first year that I’d made and frozen breakfast burritos and they quickly became my very favorite thing to keep on hand. 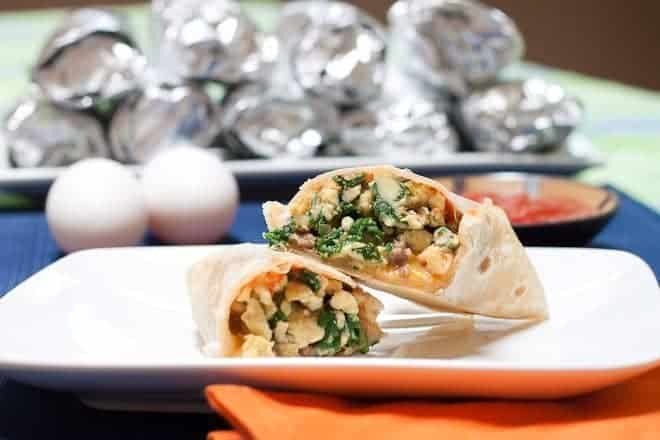 Most days I don’t mind grabbing a protein granola bar or a Chobani greek yogurt on my way out the door, but when I had breakfast burritos ready to microwave? I actually looked forward to breakfast! First, heat a skillet and brown up some onions and sausage. I used pork sausage this time, but that can easily be switched out. I’ve used bacon, turkey sausage, chicken sausage, and sometimes I just leave out the meat altogether. 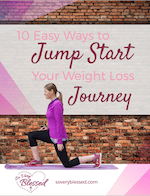 *Make sure to check out the suggestions at the bottom of this post for tips to make them healthier! Then whisk up a bunch of eggs with a little salt and pepper. 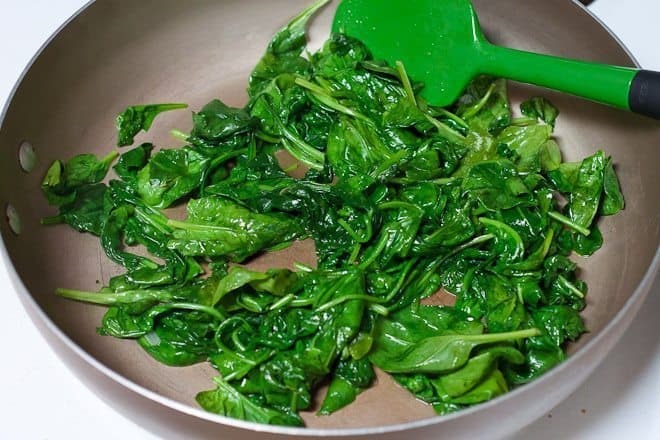 Heat up a separate skillet and toss in a bunch of baby spinach. It looks like a ton, but it cooks way down. And, really, you want to eat a ton of spinach. I’m pretty sure Popeye knew all about the flavonoids, carotenoids, and anti-inflammatory effects that spinach offers before we discovered them. That sailor man was such a hipster. Cook it for a couple minutes until it wilts. And pour in the eggs. Scramble them until they’re all cooked. Then set up your assembly line. I also like to pre-cut a bunch of foil squares to have ready to wrap the burritos in after they’re rolled. The order I like to use is: salsa, eggs, meat, cheese, then roll. Feel free to mix it up, but I like the salsa on the bottom so it’s not as messy to roll them. The moisture in the salsa actually steams the burrito when you reheat it in the microwave, so it helps to keep the tortilla soft. Wrap the burritos individually in foil, then stick ’em all in labeled gallon-sized freezer bags. Then nestle them safely in your freezer, so that when your alarm starts blaring (or in my case, thanks to a fun 12-year-old that I know, serenades me with Justin Bieber’s “Baby”) at 5am and you’re groggily zombie-walking around the house getting ready to go to work, you’re only 3 minutes away from a hot, dishes-less breakfast. 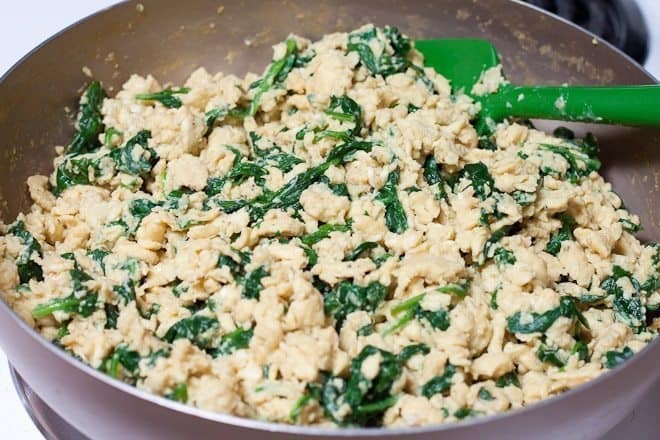 I like that the protein keeps me full longer and the spinach adds a healthy punch of all kinds of vitamins and nutrients. Add more veggies! I often add bell peppers or finely chopped broccoli and you can add mushrooms or zucchini, as well. 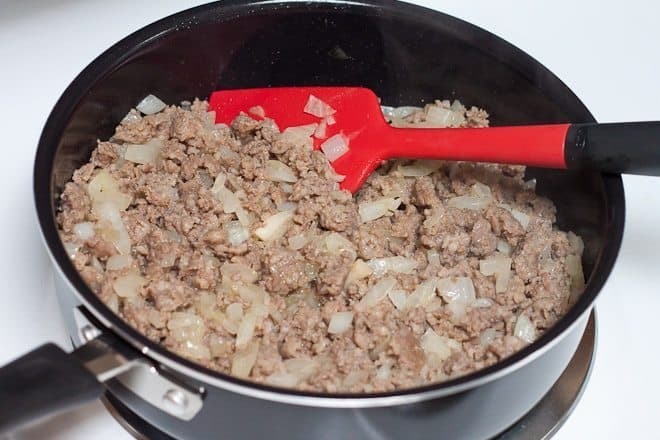 Add sausage and onion and cook until sausage is no longer pink. Drain, reserving 1 Tbs grease. Preheat another large skillet over medium heat. 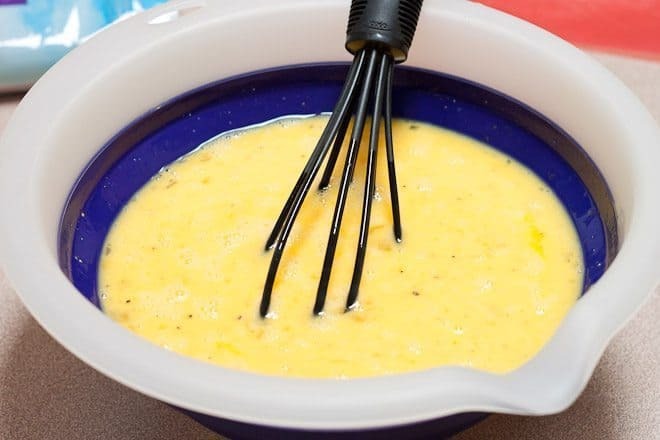 In a mixing bowl, whisk eggs, salt, and pepper. 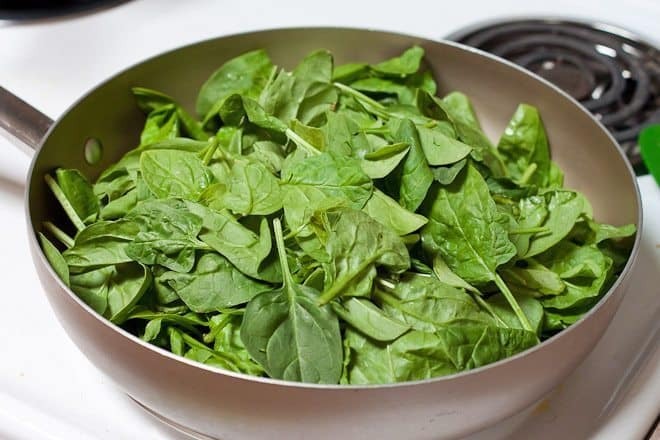 Add reserved grease and baby spinach to the skillet and cook until spinach is wilted, about 3 minutes. 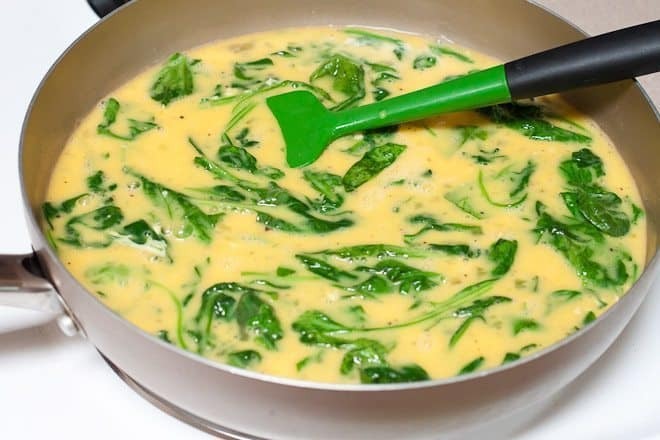 Pour eggs into skillet and scramble until eggs are set and remove from heat. 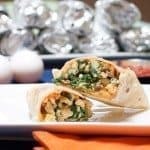 Assemble each burrito by filling a tortilla with salsa, eggs, sausage, and cheese, then wrapping each in foil. 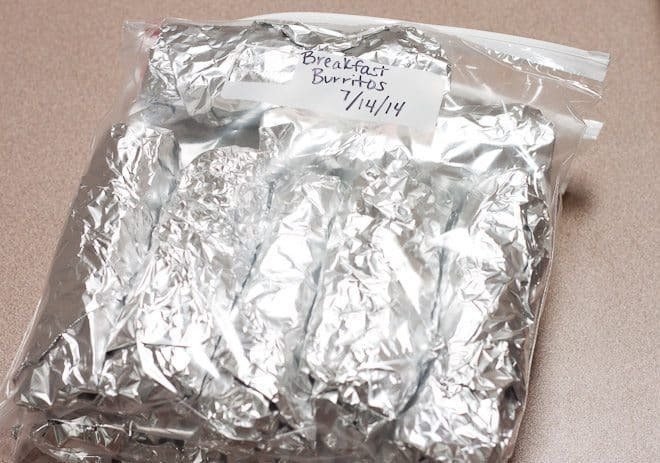 Place foil-wrapped burritos in freezer storage bags. To reheat frozen burritos, unwrap from foil, then re-wrap burrito in a paper towel. Microwave for 2-3 minutes, or until heated through. 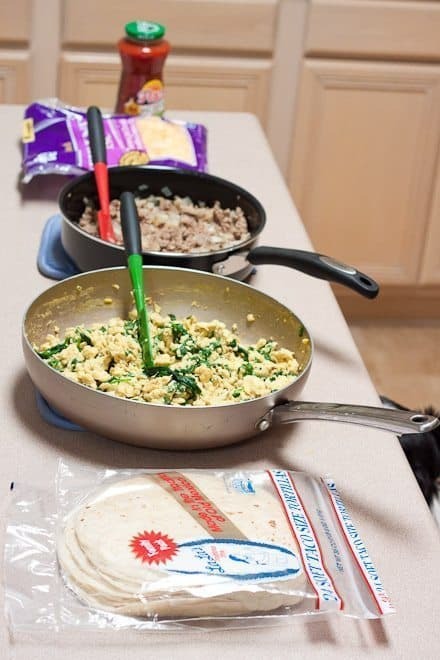 **Weight Watchers Points – If you use carb smart tortillas and turkey sausage, one serving equals Weight Watchers/WW Freestyle – 6 smart points.